Today, my family and I had the chance to visit a house once owned by Parson (Mason Locke) Weems, famed for writing the first biography of George Washington (and the man responsible for introducing that silly story about Washington chopping down the cherry tree as a child). The house is for sale at auction next month and today was an open house. My family doesn’t have much chance of buying it (though I was assured that it could well sell for “under a million”), but we enjoyed touring the house and the 25 acre grounds of Bel Air (especially since after the sale, it’s likely to be inaccessible again as a private residence). Originally built in the 1740s, it was renovated in the late 19th Century and again in the mid- and late 20th Century. It is oddly accessed by driving through a very modern neighborhood (a contrast which I tried to capture in the last group of pictures in the Flickr slideshow at the bottom of the page). There is a great deal of land that comes with the house, but the house itself is quite close to the neighborhood and a nearby modern church building. Still, the house is a wonderful blend of the modern and the colonial, from the formal sitting rooms on the main floor (see image below) to the wireless router and laser printer in the office, from the servant staircase that leads to a door on the second floor living room and the full hearth in the same room as the modernized kitchen appliances. The grounds would be a wonderful place for a garden party, although they could use a little work. There is also a small family graveyard, where Weems is apparently (though not definitively) buried. All in all, it was a pleasant way to spend an afternoon with my family. Now we just have to start a Kickstarter fundraiser to be able to buy the house ourselves. If want, you can sent them moving cards and ask for personal visit some day. 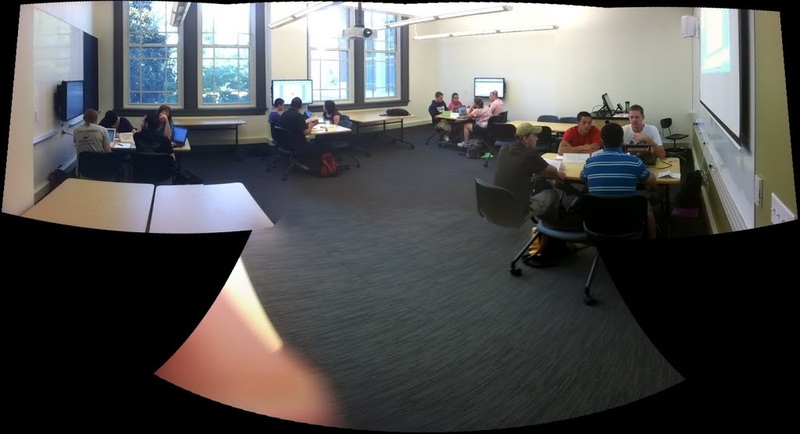 The class was the History of the Information Age, the building was Monroe Hall, and the classroom is our new flexible space classroom. Look for a post on the latter coming in the next couple weeks. It’s all over but the grading…. …and as soon as that’s done, I’ll have a long post about the digital history class (if only because I have three presentations at three different venues lined up about it in the next 7 months and I need to start figuring out what I’m going to say…). I should note that although I (via UMW’s excellent Division of Teaching and Learning Technologies experts) presented Omeka to the students as one of many options, they all seemed to quickly get its possible uses as an archive and presentation tool. We began with a test Omeka installation for the entire class with which all the students played around. Now, each group will have its own Omeka installation to begin this week to populate with photographs, scanned documents, and videos. I’d be interested in hearing about how others are using Omeka in their own classes. I Enter the WPMU Blogging Fray…. This post is a quick summary of my digital pedagogy plans for this semester. In one class, I’m repeating the wiki-as-discussion starter experiment from last spring. In this class, the first half of an upper-level course on US Women’s History, the wiki has already been the site of a great discussion of the theory, history, and current implications of the history of women. In my new First-Year Seminar on the history of the experiences of returning American veterans and my significantly revised Historical Methods class (required for all history majors), I’ve taken advantage of the new WPMU (WordPress Multi-User) installation begun at umwblogs.org. Each class has a course blog (what Barbara Ganley calls the “Motherblog”), and then each student has their own blog, listed in the blogroll. Using RSS, eventually I want to feed their posts into the course blog itself. In both classes students are required to blog at least once a week and post comments on two of their classmates’ blogs a week. In the Historical Methods class, although they sometimes will have specific blogging topics, at other times, I want them to write freely about their research process, to explore their writing, to discuss their own interests in aspects of history, and to respond to the ideas of others. So far, everyone in the classes has set up their blogs and made one post introducing themselves. Here we go…. What do I hope to accomplish with this use of blogs? Oh, lots and lots…. This online space will be used in a variety of ways–a research log, an assignment location, a place to discuss your project and the projects of others–but the ultimate goal is to allow you to create a shared space where you can display your work and begin to reflect on your learning, an electronic portfolio of your time in this class, and hopefully in connections to other courses as well. Suggestions for improving this system or encouraging student blogging? Please let me know. The other day I was discussing the future of history with a number of students in my historical methods class (a regular end of the semester activity in this class). I was asking them how they think the Internet is transforming the practice of history. I expected a discussion of the importance of online primary sources, the broadening of research possibilities for undergraduate students, and the topics that could be found and explored through search engines. To be sure, that was the gist of some students’ comments. when I discuss online collections of primary sources and historical information). For my students, the Internet is a more-or-less seamless information source, and one for which they have trouble tuning out particular parts. In fact one student said that she much prefers offline research (in books of all things) because of the lack of distractions. If that’s true (and I acknowledge that I may be overstating the dichotomous perspective) then what are the potential effects on our teaching? I now believe that it is even more important than I realized before to get students to identify the sources of particular information in order to better ascertain bias and veracity of online materials. Overcoming the seamless (sourceless?) nature of the web may be a bigger problem than I thought. Or should we of a slightly older NetGeneration just accept the view that the Internet is increasingly seamless and come to terms with a new more-or-less unified way of presenting information? Digital Literacies and Technology Proficiencies — What do our students need to know? Over the last couple weeks, I’ve been engaged in conversations with a number of my colleagues about the question of what digital skills and fluencies students need to know to be successful in college and beyond. [The longest and most fruitful conversation was with our terrific director of Teaching and Learning Technologies, Martha Burtis.] What follows is a jumbled beginning discussion of what I feel are priorities as we look toward getting students prepared for success in classes and creating adaptable, responsible, information-literate, global citizens. If we accept this notion of skills versus fluencies, I would argue the emphasis of our digital proficiency goals should be aimed at achieving fluency, not skill mastery. Can we not expect students to come to college with a basic familiarity with the skills of digital life? Can’t basic skills (word processing, email, spreadsheets) be expected? But Jeff, aren’t there plenty of entering college students who are familiar with aspects of the digital world, but don’t know how to do all of these things? Why, yes, I’m glad you asked. Certainly a focus on fluency over skills would require institutional support in the form of a Technology Center, online guides, brief workshops (no more than an hour or two), and perhaps student tech tutors, so that students not capable of certain skills could find the answers to questions about margin changing or Powerpoint presentations or what ever they needed for a particular class. There is, I think, an important parallel here with the way we address writing in college. A small percentage of our students have poor grammar skills. [Most are quite good at grammar.] There are resources on campus to deal with those issues, but we don’t send them to a separate class on grammar (nor do we advocate all students take a test on grammar). The school does have a writing intensive requirement, however, that necessitates students demonstrate a number of their writing skills, which of necessity requires familiarity and facility with grammar. We can then focus the technology proficiency requirement on fluencies, on an adaptable ability to think, create, and operate within the digital world. And we need to make these fluencies the centerpiece of the requirement (not digital skills or even the classes/fulfillment requirements). Testing students on basic skill sets makes most of them feel like they are wasting their time on things they already know, or on things they think they’ll never use. Broadly stated, what do I see as the key competencies of digital literacy? In determining the success of the digital fluency approach (and more generally of the technology proficiency program), we need to make sure that the assessments are not multiple-choice, specific skills tests, but rather allow students to demonstrate competencies within a framework of actual activity and usage. What do you think? Is this an approach that makes sense? Is it an approach that can garner support among faculty, students, and administrators? I started to write this post in the comments section of my last post, but realized it was getting prohibitively long to fit in the comments. I don’t disagree with either of the comments raised by Steve and Jerry. Various parts of what I described as e-portfolios could be started without a full-blown university-wide e-portfolio system. [And some of my colleagues at CGPS have already begun to do so.] All that is good. Students could demonstrate competencies in technological proficiency and/or digital literacy (they’re different things, a subject for a future post), they could maintain online archives of sorts of their written work using blogs or wikis or some other medium, and even reflect on that work. But would students do that on their own? Probably not. Will they do so when it’s assigned? Likely, and they might even get something out of it. But without other professors doing the same thing they’re not likely to connect it to a larger educational experience or broader world. I guess the real appeal to me of the e-portfolio (beyond the practical function as an accessible place to collect work) is on the grand scale. One place to assemble the work of a college career, one place to reflect on four years’ worth of research, writing, even presentations (digitally recorded), one place to make connections between courses and concepts, between science and literature, between language and society. Steve’s right in his comment that this reflection could be going on all the time. Heck, it should be going on all the time. But what appeals to me (and what I see as its biggest problem) is the notion of some kind of complete integration of the e-portfolios, a notion that would require grass-roots and top-down support from administration, faculty and students. Since I have trouble envisioning that broad institutional buy-in, I’m having trouble buying into doing this piece meal. I suppose my pragmatism is blocking my vision in this case. Maybe this is the kind of thing that might best be tried out at the departmental level. [If any of my departmental colleagues are reading this, rest easy. This is a thought piece, not next meeting’s new business agenda item.] A department could decide that it wanted its majors to collect their writings, speeches, and everything else related to the major in one place; that it wanted its majors to be consciously reflective about their courses and the material/concepts/skills learned in them; and that it wanted them to explore the value of that content and those competencies for their own goals in and after college. E-Portfolios — What’s the Point? It’s not very original of me to keep playing off of someone else’s blog, but Will Richardson’s post, No Child Left Without a Portfolio, inspired me to write on something that I’ve been thinking about quite a bit over the last couple years. I recently took part in a technology roundtable discussion with members of my institution’s faculty and staff (and a couple of students) about the future of our technology proficiency requirement for our undergraduate students. A couple of colleagues from our graduate campus noted that they were beginning to use electronic portfolios to assess computing proficiency, as well as present pedagogical skills. I commented that I thought most undergraduate students already had a default portfolio of projects (papers, PowerPoint presentations, spreadsheets, and other electronic materials), but it was sitting on their computers, unorganized and unused since the assignments for which they were created. Certainly those materials might be collectively used to demonstrate the array of technological proficiencies that our students learn. Still, that use of electronic portfolios seems rather limited. What is the point of electronic portfolios, why would we want to use them, and why has there been such resistance to the idea of them on many campuses? I think the answers to these questions are connected. This gets at what my colleagues from CGPS and I were discussing before. Many teaching programs require paper or e-versions of these now. Due to privacy the latter uses would depend on selective approvals by students. Broadly speaking, I think the variety of uses of e-portfolios actually hinders their acceptance. They mean too many different things to too many different people (and/or disciplines). Some see them as demonstrations of competencies (often of very specific skills or ideas); others see them as reflective tools to discuss progress and learning (a reflection which some people see as not relevant to their discipline). Then there are the practical issues about online portfolios. What responsibility does the school have for keeping these portfolios? How long is long-term? Ten years? Twenty? Permanently? Sure, hard disk space is cheap, but servers and personnel to maintain them aren’t. Given the numerous problems with privacy and data thefts lately, how much responsibility would schools have in safeguarding access to this material? None of this is to reject the idea of e-portfolios–I’m especially attracted to the notion of reflective/self-correcting consumers of information and I think they can serve practical goals in demonstrating competencies–only to note that if a school is to take on such a project it would need an extremely clear set of goals (and a long-term plan) to deal with the practical issues. As part of the ongoing reexamination of our curriculum and approaches, my department has been working on the goals for our major, on what we hope students will have learned by the time they graduate. As the amount of information available online increases at near-exponential levels, the need for students’ digital literacy grows as well. This is a new facet of the approach historians and history students have long employed, that of judicious skepticism. These require the same level of rigor applied to traditional papers and presentations. What have we left out? Probably something about encouraging active participation in an online world (hat-tip to Jerry on this), though I’m still working on ways to write that section. Other suggestions? Students who become fluent in all these areas will be adaptable, reflective consumers and producers of information, critical thinkers able to take on any number of occupations, aware of the diversity of thought and opinion in the study of the past, and ready to move forward into the larger world as responsible, productive citizens of local and global communities. None of this is finished yet (and we still are in the midst of curricular discussions), but I can’t help but be excited about the direction the department and the institution is taking. We are looking to the future in useful ways, for us as teachers/mentors/learners and for our students as learners/mentees/teachers.